The biggest swell of the season – one of the biggest on record, say officials – peaked Monday on Oahu’s North Shore. Conditions were extreme enough to prompt the closure of the parking lot at Waimea Bay Beach Park. Lifeguards performed 34 rescues and 1,745 preventative actions on Oahu’s North Shore, and 68 rescues and 865 preventative actions on the west shore. The swell arrived Sunday with surf about 12 feet, but that all changed overnight. Lifeguards opened towers at Waimea Bay and Rock Piles and began patrols at 8 a.m. from two rescue watercraft. “Very large swell. We’re looking at right now 40- to 45-foot face value and a solid 20- to 25-foot Hawaiian,” Atwood said. All the sand that was taken from beneath the homes this summer at Ehukai, also known as Pipeline, ended up at Ke Iki Beach. Monday’s massive northwest swell is now covering the beach, and homeowners are hoping the waves brings the sand back to where it belongs. 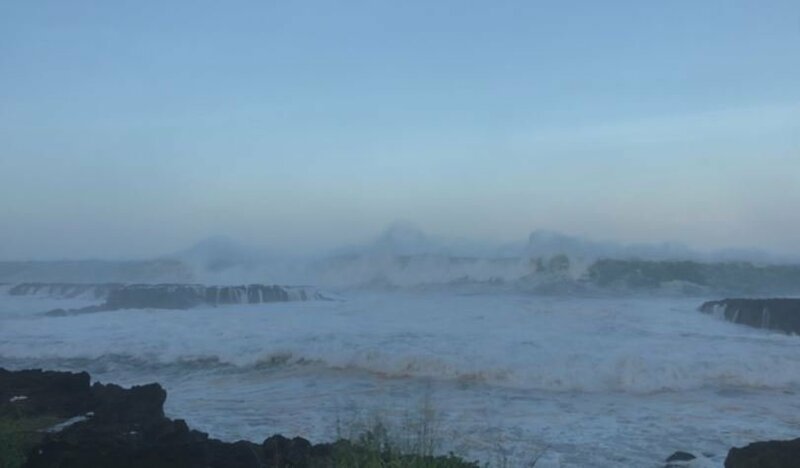 Down the road, the fence broke off at Rock Piles overnight, and surge from the huge waves started to cross Kamehameha Highway with sea spray completely covering the North Shore. But the massive swell didn’t stop professional surfers from taking on Waimea Bay. “Lots of rescues at Waimea Bay, lots of surfers needing assistance from rescue operators,” said Atwood, who noted that some of the rescues involved surf photographers. On Oahu’s west shore, the state closed Yokohama Bay Monday. Waves were expected to reach 20 to 30 feet. I know how big and powerful those waves are. More than 30 years ago, I went to Oahu’s north shore and lie on a beach. I felt ground shaking whenever waves crashed into the beach. North shore has much bigger waves than Waikiki beach. But I cannot imagine the biggest waves in north shore in the history? The ground might get M4.0 kind of shaking. The island huge wave could be cause earthquakes on ocean floor.